SQLyog allows you to execute a batch file of any size (yes....any size - limited by the OS) created using mysqldump or SQLyog's Export Database As Batch Script option. 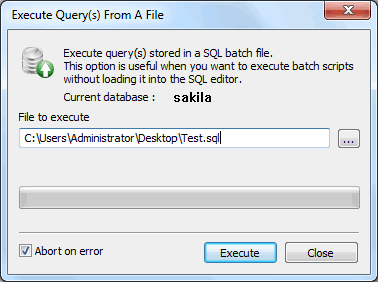 Select Tools -> Execute SQL Script (Ctrl+Shift+Q). Select the file and press Execute. If SQLyog encounters an error it stops further execution and logs the query as well as the error message in sqlyog.err located in the SQLyog installation folder.